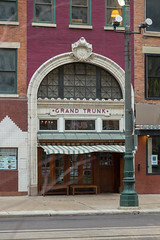 Really, if I say “old school railroad ticket station turned into a bar”, you’ve got a pretty good description of the Grand Trunk; the architecture is still centered around the old ticket counter, and since the place shifted from being “Foran’s”, it had more than a little sprucing up, so there’s still a lot of nice wood- and stonework throughout the joint, and it’s one of my favorite places downtown to grab a quick beer when I’m visiting (they do a particularly good job offering an assortment of local beers, and Grand Trunk also runs the similar Whiskey Bar next door if I’m leaning that direction). But it’s also a pretty good place to have breakfast or lunch, in this case, it was a good chance to indulge in a surprisingly large and generous Reuben served up with some potatoes O’Brien (culinary note to myself: Michigan seems to have a lot more “Potatoes O’Brien” than most places in the country; I’m sure there’s a backstory here, along with why Detroit seems to have so much pastrami). In this case, it’s everything I’m looking for in a good Reuben: while it weighs in at a hefty $12.75, the primary reason for that is that the sandwich itself weighs impressively at over a half pound: a thick layer of pastrami (from Wigley’s, a local purveyor) that’s been lightly grilled before assembly, a good layer of locally-made kraut, a nice layer of oozing Swiss cheese, a light shmear of dressing, and two thick slices of crispy dark rye bread. 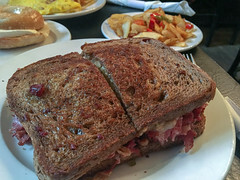 It’s one of the better Reubens I’ve had, actually. Overall, I enjoy the Grand Trunk Pub, and it’s always a neat place to visit for food and dirnk. Oh, and a special nod for Grand Trunk also offering a nice discount for showing my FIRST Robotics badge; always great when a town reaches out to visitors).